Did you know that "Ni" in Chinese means "You"! Location: As long as I'm here, what does it matter? Ni in chinese is pronounced as nee, is it not? Looks like I need to brush up on my mandrin. Welcome to the looneys. Expect your alpaca soon. 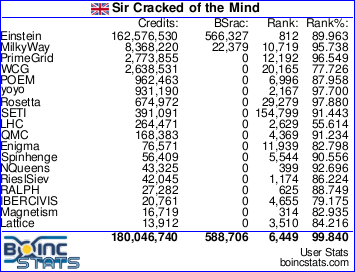 Hello and welcome to the team and join are other BOINC projects besides just LHC. All that folding was just Pity! That is true! This is not the Pity thread. details details.... yes, you are right. OK, on KWSN for CPDN also... have other goings on for SETI and Predictor at this time.